Jan Walker, R.N., M.B.A., Jonathan D. Darer, M.D., M.P.H., Joann G. Elmore, M.D., M.P.H., and Tom Delbanco, M.D. Although only a small minority of these doctors’ patients used the portals, the initial findings were striking. At the end of a year, four of five patients had read the notes, and among those who responded to a survey, large majorities reported having better recall and understanding of their care plans and feeling more in control of their health care. Moreover, two thirds of patients who were taking medications reported improved adherence. Doctors reported little effect on their work lives and were surprised by how few patients appeared troubled by what they read. Although the notes were not formally evaluated, the majority of doctors reported not modifying their tone or content. A minority, however, reported changing the way they addressed four potentially charged topics: cancer, mental health, substance abuse, and obesity. After the first year, 99% of the patients surveyed wanted “open notes” to continue, 85% of the patients indicated that ready access would be important for their future choice of a provider or system, and no doctors chose to discontinue the practice. Early adopters are learning that implementation means more than simply mailing notes or visit summaries or having patients log on to a portal. For starters, the knowledge that patients (and often their families) will have access to records affects the intent and sometimes the content of clinical documentation. Writing accurately about a suspicion of cancer, for instance, can be difficult for clinicians who don’t want to worry patients unnecessarily, and addressing character disorders or cognitive dysfunction in ways that are useful to patients, consulting providers, and others who use the records requires carefully considered words. These challenges are compounded by today’s electronic records, in which the story weaving together social, familial, cultural, and medical contributors to the patient’s health and illness often disappears, obscured by templates. A boon to billers, quality assessors, and researchers, such records can become formulaic and susceptible to data-entry errors. Moreover, they’re often filled with copied-and-pasted information that buries the essential narrative under voluminous repetitive text. As open notes spread at our institutions, clinicians are expressing widely varied preferences. Some want the option to hide notes, or portions of notes, from patients or families, and some want ways to communicate with colleagues privately. Some worry that “watered-down” notes will obscure important medical details, and mental health professionals appear to be divided about the effects of sharing their notes with patients. Overall, our experience suggests that doctors initially feel safest when they can choose what patients can see, but as they evaluate feedback from patients and colleagues and learn to discuss choices with their patients, their preconceived limits tend to fade away. Ideally, both patients and providers should be able to set preferences about sharing information, but current health information systems can’t handle such nuance. As patients become familiar with medical records and clinical notes, they consider new opportunities and risks. Some say they have become more careful about what information they share with clinicians, and some ask for more control over access to their information. Providers are experimenting with strategies that help patients protect their privacy with regard to mental health, sexual function, suspected abuse, or other sensitive topics. And though family caregivers may find that reading notes improves their understanding of care plans and reduces stress, it’s a complex task to establish separate proxy access based on patients’ preferences about who gets to see what. As transparent practice evolves, it’s impossible to predict how much patients may stray from long-standing conventions. Portals afford patients secure access to their information, and doctor–patient confidentiality remains undisturbed. But patients’ attitudes toward privacy may change as online access allows them to share documents, including notes. A third of patients in the OpenNotes study expressed concern about privacy, but more than one in five shared a note with others who could clarify meanings, offer clinical insights or second opinions, or — for those participating in the patient’s care — improve their own knowledge. Indeed, some patients may choose to post their providers’ progress notes on Facebook, Twitter, medical forums, and other social media, potentially exposing clinicians to public scrutiny and crowd-fueled praise or criticism. Among the institutional adopters we’ve encountered, most have opened access to notes written primarily by ambulatory care doctors. We expect that patients and families will find other notes useful, too, including those from nurse practitioners, physician assistants, case managers, social workers, pharmacists, rehabilitation specialists, and others. And health care systems will probably expand open notes to inpatient hospital services, recuperative and rehabilitation centers, long-term care facilities, home care, and other settings. Although nearly 90% of the patients we surveyed indicated that they would want inpatient notes to be accessible, offering access during stays in acute care hospitals would be particularly complex, since a patient’s status may fluctuate, multiple clinicians may offer opinions, and plans may change frequently. Regardless of the setting, open notes can help improve patient safety by allowing contributions from patients and families who may catch questionable statements or clinically important mistakes in notes or find lapses in follow-up that need to be rectified. Indeed, the very existence of an environment in which patients are encouraged to identify potential errors may increase patients’ trust. But policies and processes for amending records remain in flux and vary widely among record systems and practice settings. Despite the challenges, nearly 2 million Americans already have access to notes, and we anticipate that open records will become the standard of care, accompanied by electronic tools that explain medical terminology and abbreviations, translate notes into different languages, and adjust for health-literacy levels. Given that more than half the patients we surveyed wanted to add comments to their doctors’ notes and approximately a third wanted to approve what was written, we expect that patients will soon share in generating content such as family and social histories and descriptions of their subjective experiences with illness. Indeed, we believe that ultimately notes will be signed by both patients and providers, as they become the foundations for planning care, monitoring the course of health and illness, and evaluating care processes and outcomes. Shenkin and Warner predicted that increasing patient engagement through transparent medical records would contribute to improvements in health, care, and costs. As open notes continue to spread, and strategies and safeguards evolve, we expect that both patients and providers will benefit from the wisdom of their proposal. This article was published on December 4, 2013, at NEJM.org. From the Division of General Medicine and Primary Care, Beth Israel Deaconess Medical Center and Harvard Medical School, Boston (J.W., T.D. ); Geisinger Health System, Danville, PA (J.D.D. ); and Harborview Medical Center, University of Washington School of Medicine, Seattle (J.G.E.). ST. PAUL, Minn. — Remember Watson, the IBM supercomputer which made headlines last year by trouncing the top two contestants on the TV game show, Jeopardy?Watson’s million-dollar prize went to charity and now Big Blue is seeking gainful employment for Watson other than as a professional game show contestant. Today, IBM’s chief medical scientist visited a Minneapolis hospital to talk about how Watson’s artificial intelligence could help doctors wade through loads of research data and apply that knowledge to treating patients. Bulking up on a steady diet of the latest medical research, journals and textbooks, IBM’s Watson training to be a doctor’s assistant — an assistant who understands natural language and can provide a physician with a list of possible diagnoses and rank potential treatments. At this stage, Watson is far from being able to do that job in a clinical setting, but that is the hope. Named after IBM’s founder, Thomas J. Watson, a team of IBM scientists created the supercomputer to analyze human language, process huge amounts of information and return answers in less than three seconds. 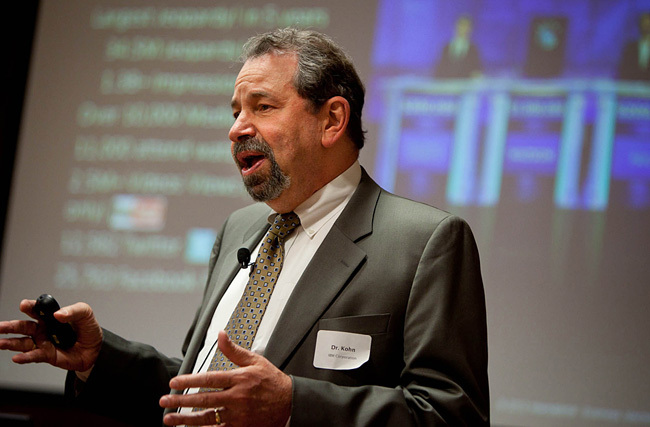 IBM Chief Medical Scientist Dr. Martin Kohn told a group of health care workers at Abbott-Northwestern hospital that Watson would not make decisions for them; the goal is to help them make better decisions. Kohn said there is no way that physicians can keep current on all the latest medical breakthroughs, but Watson could. Health care is increasingly pushing doctors to choose treatments based on the best evidence available about what is effective. IBM is touting Watson as a way to provide that analysis on the spot, but the computer still needs to get up to speed. 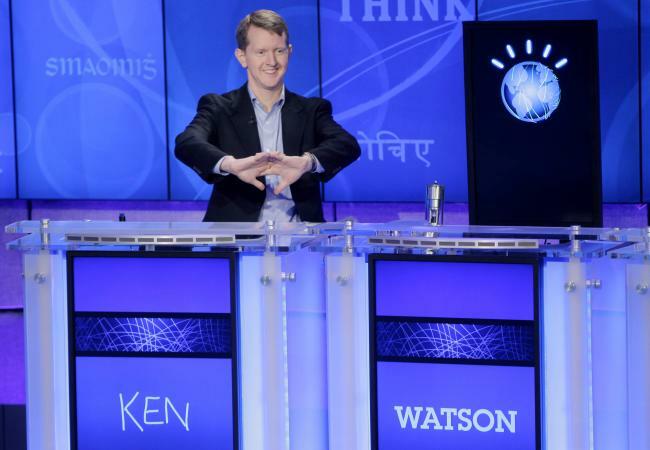 Watson is getting that training at New York’s Memorial Sloan-Kettering Cancer Center, which agreed to collaborate with IBM. The Cancer Center is providing Watson 1.5 million patient case histories and its specialists are developing systems that will allow Watson to correctly analyze medical questions. Sloan-Kettering’s head of Thoracic Oncology, Mark Kris says Watson will be helpful to cancer doctors because oncology research moves at a rapid pace. He says Watson can provide doctors with an instant consultation. Watson is not without its limits, however. Despite single-handedly beating the Jeopardy! champions, it also made what IBM concedes were some “spectacular errors.” In one of the final rounds, the category was U.S. cities. For all of Watson’s vaunted processing power, the computer came up with an answer that wasn’t even in the right country. Watson’s human rivals got the answer right. Watson’s miss received a lot of ink. But IBM’s Kohn explains Watson’s confidence in that response was very low. But under the game’s rules offering no response would have been a guaranteed wrong answer. Kohn says in the clinical setting Watson will provide physicians with its confidence level in a list of diagnoses and treatments. In March, IBM announced it had formed a Watson Healthcare Advisory Board which includes representatives from leading cancer centers. Mayo Clinic is notably absent. Dr. Dawn Milliner of Mayo said the world renowned clinic is in discussions with IBM about a potential role. IBM and Sloan-Kettering hope to have Watson ready to begin a pilot project analyzing cases by the end of the year. By Delos M. Cosgrove, MD | 9/30/13 12:17 p.m.
Delos M. Cosgrove, MDDelos M. Cosgrove, MD, is CEO and President of Cleveland Clinic, where he presides over a $6.2 billion healthcare system. Posted on October 30th, 2013 by John Noseworthy, M.D. This morning, I presented at the Massachusetts Medical Society’s “State of the State’s Health Care Leadership Forum” in Waltham, Mass. I shared how Mayo Clinic as an academic, integrated group practice of medicine is responding to profound change in health care. Fragmentation is real and a profound problem for health care in America. It results in uneven quality and drives up health care spending. Too often, as providers, we use resources in ways that lead to repeated tests, procedures and treatment delays. Mayo Clinic believes providers have an obligation to lead. To address fragmentation, Mayo Clinic is focused on efforts to create value, improve quality and reduce costs. This approach is reflected in Mayo Clinic’s work today — through initiatives that improve safety, access and integration of care for patients. Examples include Mayo Clinic Care Network, our work in telestroke and efforts to help patients recover from surgery more quickly. We are sharing knowledge to deliver patients the best health care, health guidance and health information. We recognize and appreciate that the cost of care is a tough nut to crack. We believe that driving change is best done with data and teams of people working together to address the problem. For Mayo, our most scalable asset is our knowledge. We have found sharing knowledge is a powerful integrator that reduces fragmentation, improves quality and drives down costs. Editor’s note: John Noseworthy, M.D., is the president and CEO of Mayo Clinic.